Our 5 year old son loves music, especially guitars. For his recent birthday I found some great items and made some of my own! 1. Made a guitar shaped birthday invitation on the computer. It was star shaped with the guitar handle then cut out in that shape. 2. Inflatable guitars. The kids loved them. Reasonably priced and available at my local party store. They were a great surprise for the kids when they learned they could take them home as a part of their loot bag! 3. Musical Squares. A twist on musical chairs. I printed out 8.5x11 sheets on the computer with a musical border and a set of foot prints in the middle. Played some kid themed rock and roll songs and they danced around till the music stopped and then had to stand on the remaining squares. 4. Rock Star photo shoot. 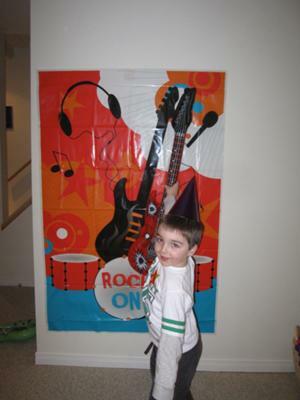 I had a back drop taped to the wall that the kids posed in front of it with their guitars for a celebrity feeling. The parents thought that was really fun! 5. Cupcake microphones. Cake filled ice cream cones iced and decorated to look like mini microphones. Another hit with parents and kids. Everyone said they really enjoyed the party and we were all exhausted from all the singing and dancing. Kids all slept great! Join in and write your own page! It's easy to do. How? Simply click here to return to Your Party Ideas.